A low-cost mechanized harvester is demonstrated in Kisumu county, Kenya. Mechanization of farm operations can dramatically cut costs and improve quality. We’re working with two private firms to scale out low-cost mechanization options for rice farmers in Kisumu. Nyabon Enterprises provides equipment and trains service providers on operation and maintenance. Cool Trends leads the farmer training component. A range of equipment is available: power tillers, rotavators, weeders, sprayers, harvesters, threshers, even briquetting machines to compact prilled urea into granules for higher fertilizer-use efficiency. But farmers will not mechanize unless there are credit options to buy or rent equipment, and service providers that are reliable and affordable. We worked with the Kenya Commercial Bank to develop low-interest loan products. The first loans will be disbursed this cropping season, to enable budding entrepreneurs (mostly youth) to buy mechanized harvesters for use during the 2019 harvest. More than 35 youth have been trained, not only on the use of mechanized implements, but also on other areas that would complement mechanization – crop spraying, fertilizer pelleting and application, even maintenance of irrigation channels. County government staff and private firms (crop protection, fertilizer) helped conduct the training. In August, youth groups were also trained on loan procedures and encouraged to form savings groups. Soon afterwards, two youth groups acquired simple equipment and are now offering crop spraying, transport and other services. Their fees are reasonable, and farmers trust them because they are part of the community – so business has grown rapidly. Both groups plan to use part of their profits to buy more equipment next season. 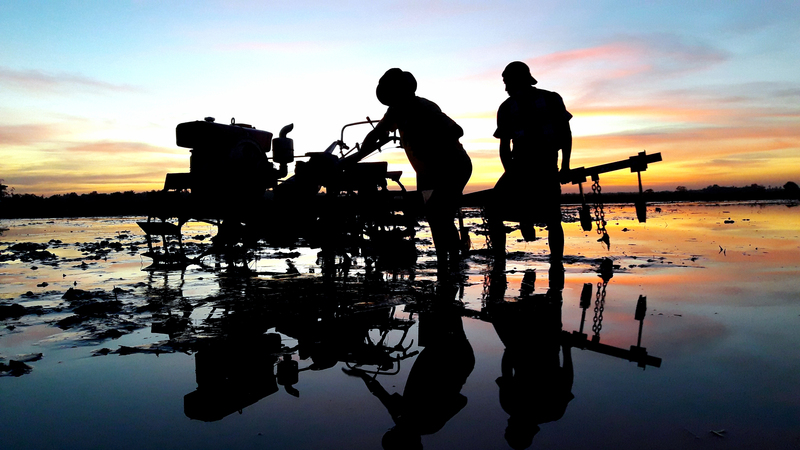 This season, farmer groups have – for the first time – pooled money to hire tractors for land preparation. Mechanization is part of a broader program that has already led to significant changes in farmer practice: use of certified seed, optimal seed rates, row planting, balanced fertilizers etc. Farmer groups have synchronized their activities to reduce pest pressure and improve marketing.